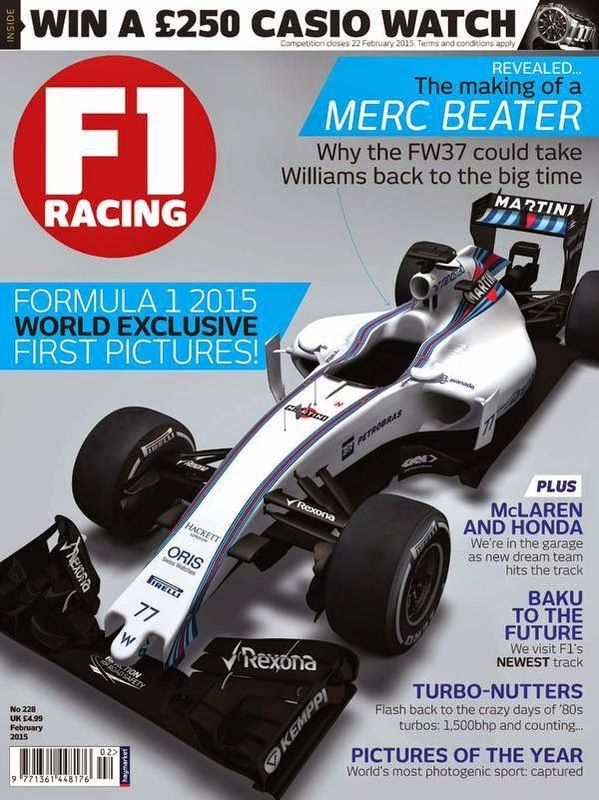 Once again F1 Racing magazine have presented the first images of the Williams contender to the world on their front cover. The team used the magazine as the launch platform for the FW37's predecessor too, in the pre-season and pre-Martini livery. 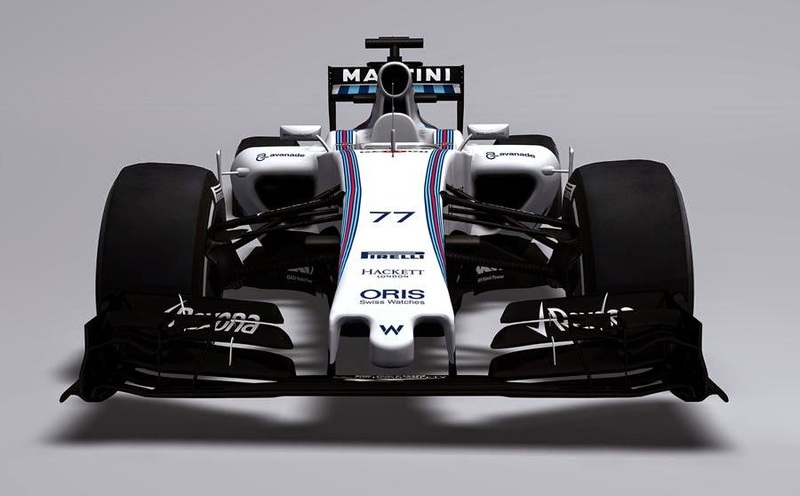 Just like the FW36 render there are things that will evidently change before the season kicks off but there are a few things we can learn from what has been shown. 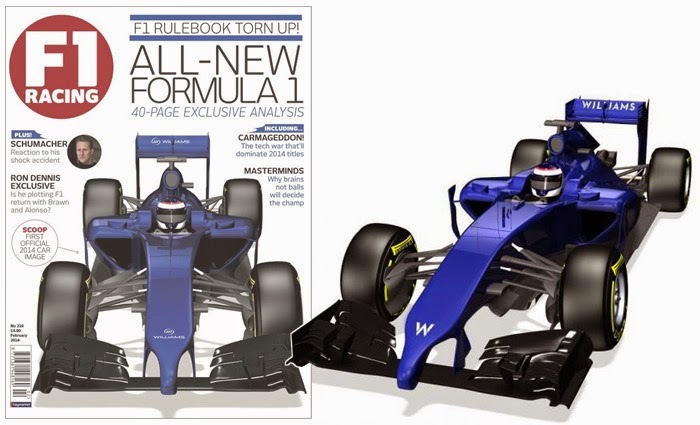 Firstly the nose, contentious as the 2014 nose designs were the FIA still haven't been prescriptive enough that the teams don't come up with designs that feature an extension. The majority of 2015 designs will feature this 'thumb' extension, shorter than its predecessor but nonetheless just as ungainly. In the case of Williams the team have set about trying to retain as similar an airflow footprint as possible with the shaping of the thumb forming a keel shape that tapers into the centreline, whilst the second regulation box 2000mm2, 150mm behind the noses tip splays the nose and the connecting pylons outward at least mitigating the loss of surface area lost from the shortening of the nose tip and/or perhaps even increasing its capacity to provide clean airflow to the splitter region. What may be lessened is the effect the nose tip had/s on the neutral centre section of the front wing, an area the teams are always intent on trying to leverage an advantage from. With the nose camera position mandated in 2014 the teams lost the ability to place those in a position that could garner and advantage and had to look to other solutions, namely the nose and pylon shaping. Mercedes ran an interesting conjoined lower wishbone arrangement in 2014 which helped to control the upwash from the front wing, creating a better Y250 vortex and controlling how the sidepod inlets received airflow. 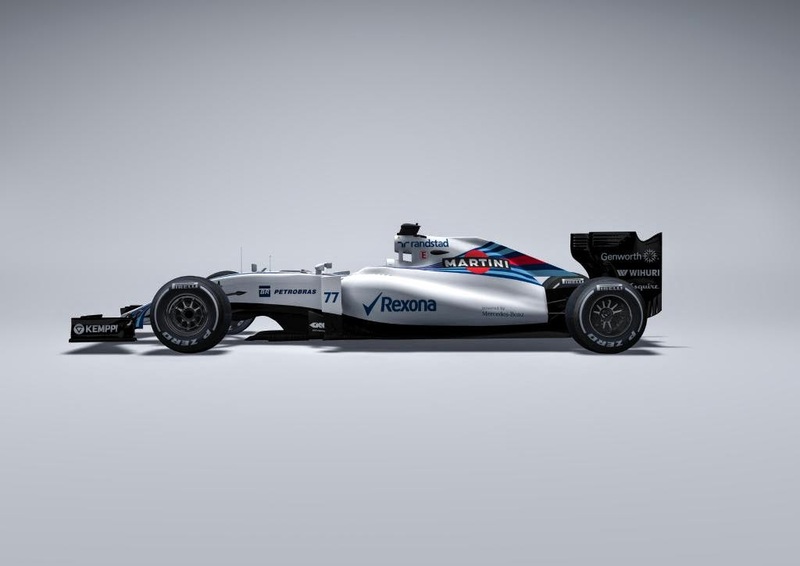 In this render of the FW37 it isn't definitive but it would appear that Williams may also be heading down this route in 2015. Having had a year to work with their new partner Mercedes in 2014 the FW37 has lost the cooling gills found next to the roll over hoop, indicating that they were initially reticent about how much cooling was required by the PU106 hybrid but now feel more comfortable. The FW37 like the FW36 appears to have followed the same concept in terms of the sidepod and engine cover bodywork, with little in terms of airflow manipulation, such as vortex generators, leading edge slats etc. Whilst the short bodywork option run by the team for the last few years, utilising the shark fin to meet with the dimensional regulations is in place once more. It is worth noting that Williams did trial a conventional engine cover layout last season (upper and lower cooling outlet), however the large lower outlet and gearbox covering aspirator are seemingly retained for 2015. You may note that the sidepods appear to be a little slimmer than the cars predecessor allowing for a more aggressive sidepod undercut, the team having seen the packaging potential of the W05 have opted to run a chargecooler (air-liquid-air) arrangement, burying the cooler within a void between the fuel tank and the ICE's front face, whilst balancing the aero for either sidepod with smaller water radiators (Rather than as last year having had the right sidepod carry the engines water radiator and the left an air-to-air cooler). At the rear of the car Williams once again defy the rest of the field and retain a rear wing assembly devoid of a central support pylon, something that featured on the rest of the field with the beam wing banned from 2014 onwards. Their reasoning behind this is in part due to the way the whole concept of the car is laid out, designed for efficiency and not peak downforce, which has often led to them topping the top speed traps and being very frugal on fuel usage. On top of this I firmly believe it suits the cooling layout, not having the issue of the pylon to circumnavigate, which is something most of the other teams have achieved with a Y-Lon. The central pylon also compromises the airflow over the central part of the wing and can lead to detachment of the airflow, albeit teams all make clever design compromises to mitigate this as much as possible. Lastly and perhaps more importantly (but please remember this a theory and not fact and so I am not inferring any wrong doing by Williams or any other team) I have to raise the question of flexibility, especially when we consider how quick the FW36 was in a straight line compared to the rest of the field. I've long held the opinion that some of the teams are using aeroelasticity to deform the rear wing assembly in such a way that it reduces drag on the straights (something that teams have been doing for decades). 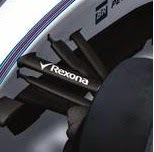 Williams lack of centre pylon brings further credence to this (albeit as per the FW36 they likely have a beam wing support at floor level again) as it would allow the endplates to deform/rotate (where as everyone else would also need a deformable pylon too) lowering drag and increasing their top speed potential. There is of course a load test in place to ascertain whether teams are flexing the flaps (a horizontal load of 100kg on the FIA inspection rig), meanwhile slot gap separators were bought in so that the teams couldn't deform the flaps at speed, reducing the gap between them and stalling the wing. As teams have worked on aeroelasticity to gain advantage from front wing flex over the last decade it's more than acceptable to expect the teams to use this knowledge in other areas, in which case if the rear wing was lent back under load it would reduce drag. Lest we forget the teams desires to achieve such a feat led to the F-Duct and a top speed increase in the realms of 10+kph. As always please remember that this is a very early look at the car and as some of the key areas (rear view, tyre squirt platform ahead of the rear tyre etc) are omitted in these renders I will revisit the analysis as and when more details become available. ¿Blown wheel nut in front tyres?